Using SP & RES logs you are provided with a basemap locating three wells (W-1, W-2, W-3). Each well has Spontaneous Potential and Resistivity logs that are used to correlate the wells. You learn how correlation can be based on bounding transgressive surfaces and the lithofacies of parasequences identified in well logs drilled in a clastic shoreline depositional system dissected by regressive high stand beach systems and incised valleys extending below sea level but formed during a low sea level. A pdf file containing all wells and a base map can viewed on electronic media that include PC, Notebook, Tablet, or Pad and interpreted with a graphics program like Power Point. 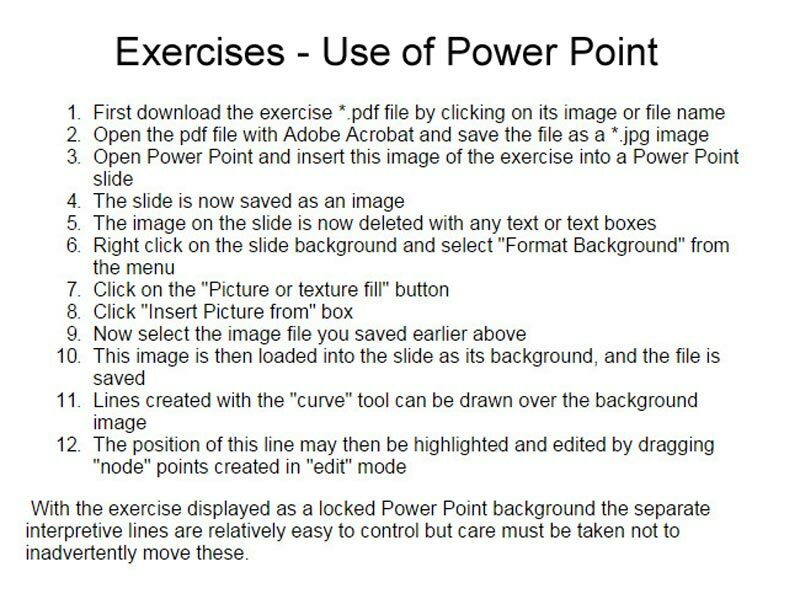 Using Power Point drawing tools, in particular curve, in the electronic media is an effective and easy way to handle the objectives of the exercise and a means for collective viewing of results in class. Click on red box for more details. The output can be printed, reassembled and taped (PRINTABLE-EX-1). A reduced pdf file version can be also viewed and or printed (VIEW-EX-1). These well logs are flattened on the top of a major transgressive surface (TS) on the silt marking the contact between the La Pascua below and the overlying Roblecito Formation. Methods: Utilize the Gulf Coast slip-slide method to help you match the log sections and identify the same sections on the various wells. Color sands yellow and shales green. Correlate using the silts as markers. For each parasequence identify the TSs transgressive surface and then correlate these on all the well logs provided. These transgressive correlation surfaces used in all the sets of exercises extend across the area penetrated by the wells, except where they are interrupted by the incision of local channels. These surfaces cap silty horizons that are equated with surfaces of transgression (TS) that formed at wave base, and above, when the sea floor was reworked just following a sea level low. Click on the thumbnail below to view the movie that demonstrates the technique that first uses the transgressive surfaces to build a framework of parasequences from these correlated surfaces and then infills the other surfaces between these as outlined below! Technique tying well logs to interpret clastic sedimentation on coast with valley incision. Click on links above to view YouTube and QuickTime movies of the output of the identification of log character to correlated and interpret the logs. The best way to view the YouTube movie frames is to first click on the pause symbol on the control bar and then use the mouse to grab the thumb (red circle) on the red seekbar (this tracks the progress of the movie) and move the thumb back and forth to chosen frames and so gain a better understanding of the evolving sedimentary geometries. In contrast the best way to view the QuickTime movies is to control their motion using the arrow keys on your keyboard. Normally radioactive peaks on gamma ray logs, associated with are more extensive and would have been better correlation surfaces than the transgressive surfaces but gamma ray logs were not available for much of the Guarico Sub Basin. As in the movie above you should use geologic logic to infer the location of the maximum flooding surfaces (mfs) and correlate these on all the well logs. Thus as shown in the film make a cross-section first correlating the prominent silts for all the wells and then correlating the sands. Pick base of massive sands and correlate these from well to well when they occur on other logs in other wells. Identify the sequence boundaries (SB) at base of the massive sands and correlate these from well to well. Identify all systems tracts, including the incised valley, on all well logs. Click on the thumbnial below to view the movie that tracks an interpretation of the character of the sedimentary fill of the Guarico Basin during the deposition of the La Pascua Formation. Well logs reveal evolving clastic sequence with valley incision subdivided into systems tracts. Click on links above to view YouTube and QuickTime movies of the output of the movie capturing the 3D perspective of the interpretation of the depositional setting from the well logs. The best way to view the YouTube movie frames is to first click on the pause symbol on the control bar and then use the mouse to grab the thumb (red circle) on the red seekbar (this tracks the progress of the movie) and move the thumb back and forth to chosen frames and so gain a better understanding of the evolving sedimentary geometries. Make a cross-section tying the silts and shales of all the wells and finally the sand geometries. If you view the above movies and have read in the earlier sections related to the geologic setting of the La Pascua Formation and the introduction to the well log response to the La Pascua Formation. you will know something of the depositional setting of these rocks. You should combine this understanding of the regional geology with your understanding of vertical and lateral facies relationships in near shore clastic settings (eg. shoreline, beach, stacked beaches, tidal flats, deltas) and Walther's Law. You should use these to build a depositional model and a sequence stratigraphic interpretation of the well log section.